At one point, jazz wasn’t thought of as wholesome,” says trumpet-performance major Joseph R. “Big Joe” Palmer (’19), pictured. Though student-formed jazz bands played for campus dances in the ’40s and the 15-member big band Y’s Men even represented the university in the ’50s, student petitions to add jazz to the music curriculum fell short. However, in 1968 two new music faculty, Bob H. Campbell (BS ’61) and K. Newell Dayley (BS ’64), believed the spontaneity and positivity of jazz merited academic consideration and launched what is now one of the most highly acclaimed jazz programs in the nation. Last fall the BYU jazz program celebrated 50 years. 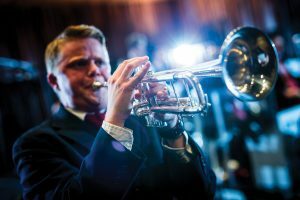 A week of toe-tapping concerts in November featured Syncopation, the Jazz Legacy Dixieland Band, Synthesis, and a 50th-anniversary alumni band. Campbell and Dayley, who each directed pieces with the alumni band, were inducted into the BYU Jazz Hall of Fame. Band director and performer of dozens of instruments—Ray Smith has combined his talents to make space for jazz at BYU.